Hundreds of new images from Thoreau's collection of plant specimens will be available for viewing online. 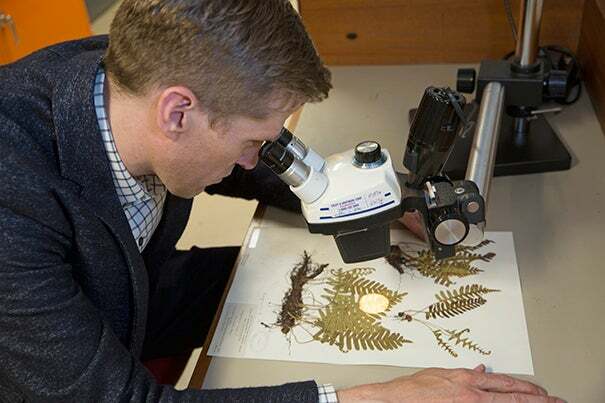 “I think it’s fair to say that the data that live inside these cabinets has been dark for far too long,” said Charles Davis (pictured), director of the Harvard University Herbaria. Henry David Thoreau wandered the forests and fields around his home in Concord, making the observations that brought him fame. He also collected specimens of the plants he found there, preserving about 820 for identification and study. 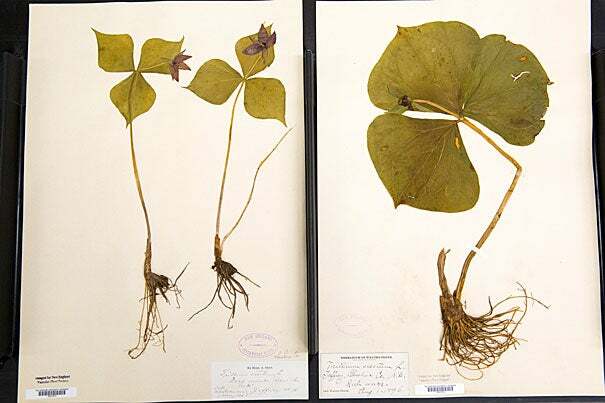 That collection, which today resides in the Harvard University Herbaria, is something of a botanical time machine. In combination with the naturalist’s extensive notes about when and where they were collected, the specimens can provide insight about the changes between Thoreau’s time and now. “They were his personal herbarium that he was using to make identifications and to record and document the flora of the Concord region,” said Charles Davis, a professor of organismic and evolutionary biology and director of the Harvard University Herbaria. In honor of Thoreau’s 200th birthday, on July 12, hundreds of new images of his specimens, along with the data associated with them, are being posted online, part of a larger effort to digitize and open to the public the 5.5 million dried plant specimens in the Herbaria’s collection. That larger effort has meant adopting a new “open-access digitization policy,” available on the Office for Scholarly Communication website, that puts most of the images — excepting those whose copyright is held by other institutions or individuals — in the public domain. The digitization project will allow scholars from around the world to view the collection online, in some cases providing enough information to make a trip to Cambridge unnecessary. Davis expects the digitization effort to increase use of the physical collection because researchers will be better able to see what’s there and to understand how particular specimens might help them answer scientific questions. More than 600,000 specimens of vascular plants, fungi, lichens, bryophytes, and algae have been digitized so far. While the fungal and algae projects continue, new efforts are focused on the Herbaria’s collection of dried vascular plants, which are pressed and flattened and can be represented well in two dimensions. Other collections, including the famed Glass Flowers (officially the Ware Collection of Blaschka Glass Models of Plants) and ceremonial headdress artifacts from the Economic Herbarium of Oakes Ames, present different digitization challenges, Davis said. Those will be tackled once the dried plant collection — which makes up the vast majority of Herbaria holdings, in both number and bulk — is complete. Jonathan Kennedy, who as biodiversity informatics manager at the Herbaria is overseeing the digitization effort, stressed the sheer size of the project. Interpreting the data associated with each specimen has been a particularly challenging part of the process, Kennedy said. Among the handwritten labels, some are more than a century old. The current digitization effort is a continuation of the Herbaria’s early embrace of the digital age, Davis said. The Gray Herbarium Index, a database of nearly 300,000 records of New World vascular plants, was an invaluable resource for scholars for decades before it was put online in 1992, during the early days of the web. Amy Gilson is first author of a recent paper on the process of protein structure evolution, which can help researchers design stable molecules for treatment.